A young lesbian girl grows beyond fear to fearlessness as she comes of age in the ’60s amid religious, social, and legal barriers. Carol Anderson grows up in a fundamentalist Christian home in the 60s, a time when being gay was in opposition to all social and religious mores and against the law in most states. Fearing the rejection of her parents, she hides the truth about her love orientation, creating emotional distance from them for years, as she desperately struggles to harness her powerful attractions to women while pursuing false efforts to be with men. The watershed point in Carol’s journey comes when she returns to graduate school and discovers the feminist movement, which emboldens her sense of personal power and the freedom to love whom she chooses. But this sense of self-possession comes too late for honesty with her father. His unexpected death before she can tell him the truth brings the full cost of Carol’s secret crashing in compelling her to come out to her mother before it is too late. 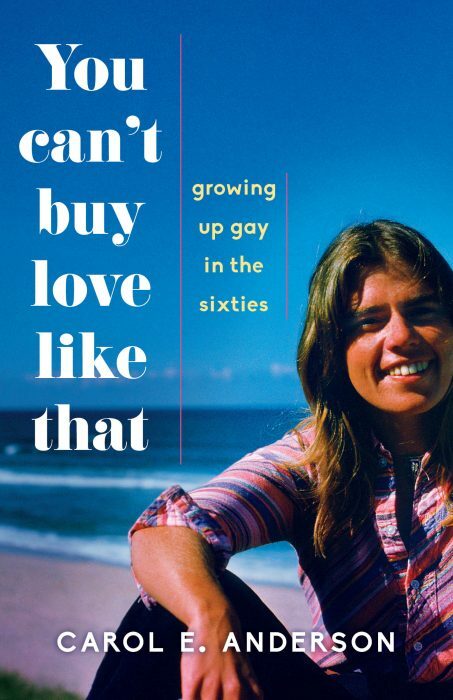 Candid and poignant, You Can’t Buy Love Like That, reveals the complex invisible dynamics that arise for gay people who are forced to hide their true selves in order to survive and celebrates the hard-won rewards of finding one’s courageous heart and achieving self-acceptance and self-love.